The North East (NE) region of India comprising the states of Arunachal Pradesh, Assam, Meghalaya, Manipur, Mizoram, Nagaland, Tripura and Sikkim is facing an environmental crisis of an alarming proportion today. Tucked away in the 'remote' Northeastern part of the country and joined with "mainland" India only by a 21 km long 'chicken neck' corridor, the region is blended with diverse geographical and multicultural features, and is a beautiful mosaic of Mother Nature. When it comes to the natural resource wealth of our country it is usually seen that the most resource rich states are economically the poorest. This is also true for the NE which is a region of low per-capita income with major growth requirements. Challenges like ethnic diversity and the insurgency problem have kept many away from NE and the larger benefits of India's rapidly developing economy have so far not been able to reach here. Even the youth have gradually moved out in search of better opportunities. Environmental degradation, habitat destruction, pollution, water scarcity, biodiversity loss, depleting forest cover, cultural pollution, big dam construction leading to environment and social implications, social unrest – are but a few of the issues demanding immediate attention in the NE region. At the same time, a relative reluctance of the Central Government to act and the simultaneous exodus of a majority of the youth population only add fuel to the fire. Now, with the threat of climate change looming large, the only option is to come together for sustainable development of the region, before time runs out and most, if not all, is lost. With this as the backdrop and in keeping with its mandate to raise environmental awareness and promote sustainable development across India, Delhi Greens is proud to launch "NE Greens" Portal, as its second project under the Green Media Network initiative. 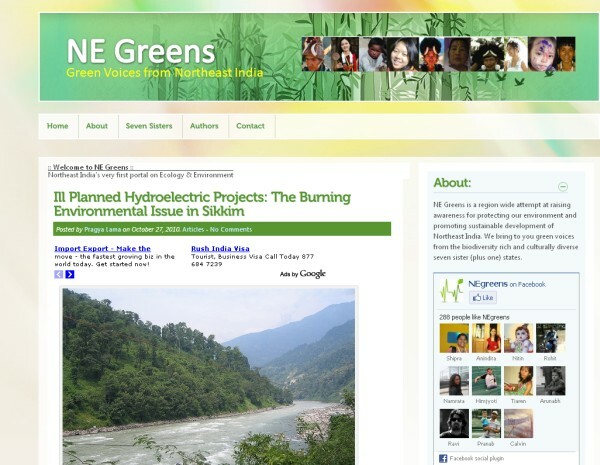 Launched as North East India's very first portal dedicated exclusively to ecology and environment, NE Greens is a platform to promote sustainable development in the region, highlight and discuss the environmental challenges being faced by the eight states and make a region wide attempt to protect the cultural and biodiversity of Northeast India. Emphasizing the need and importance of the NE Greens portal, Mr. Govind Singh, Director, Delhi Greens said, "The NE Greens portal will work to bring together people from the region as well as other parts of the country and sensitize them about the pressing environmental challenges faced by the region. The initial idea is to highlight environmental issues of the region which are now going unnoticed." Delhi Greens plans to upscale the NE Greens portals in the coming days by placing state coordinators in all the eight Northeastern states. Delhi Greens is a Delhi based Non-Governmental Organisation, NGO (Reg. No. 3,566) set up in 2007 with a vision of ensuring environmental harmony and sustainable development. The Green Media Network (GMN) is a project of the Delhi Greens organisation. The Project works to ensure widespread coverage of environmental news, information, activities, events, actions and activists in an attempt to mainstream environmentalism and create better informed citizens. With the Delhi Greens Blog as its first project, GMN believes in the power and strength of the pen (now keyboard) and has illustratively shown it to be mightier than the sword. The NE Greens Blog is the second project of the GMN. This PR was webcasted on October 27, 2010.